Have a case? Find out! Our clients never owe any fees unless we obtain financial settlement on their behalf. We will always go the distance for you. Our team and warm yet professional office environment provide our clients a personalized, compassionate and distinctive encounter backed by over 100 years of aggregate law experience. We are committed to providing each and every one of our clients with dedicated advocacy and skillful, tireless, aggressive legal representation. Our priority is providing each client with the most desirable legal outcome. Our firms contain attorneys who actively farm corn and with farming pasts who bring claims on behalf of any US corn farmer related to the premature promotion of the unapproved genetically modified seed corn Viptera by Syngenta®. Syngenta® began selling and profiting from Viptera before securing approval from China for this new strain. Because Syngenta's® practices caused China to close their markets to US corn imports due to traces of Viptera, the demand for US Corn has been drastically decreased. This may have resulted in significant financial loss for all corn farms across the entire U.S. in the form of significantly depressed US Corn prices. Justin Demerath is a fourth generation corn farmer, and a second generation lawyer, he is proudly working with his father, Larry Demerath, who is also a Nebraska attorney and a third generation Nebraska corn farmer. Our firms are accustomed to addressing the issues associated with producers and land owners, and are uniquely situated to assert these claims on behalf of farmers across the country. If you or someone you know has suffered losses due to declining corn prices we would be happy to offer a free, no obligation consultation. Attend an upcoming Town Hall Meeting in your area. Click here for dates Check back often as new meetings are announced regularly. Submit your information above to receive a simple, no obligation, new client information packet within 24 hours. Call 877-736-9459 to speak with one of our attorneys immediately. 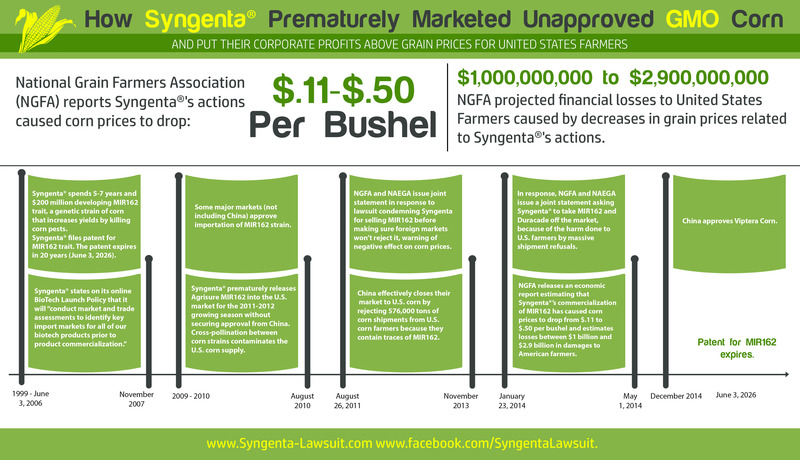 Let us help you seek to recover the market losses that may have been caused by Syngenta's® practices. If you believe you or your business has been financially harmed, contact us today for a free consultation and case evaluation. Let us help you seek to recover the market losses that may be associated by Syngenta's® practices. Demerath Law Office and Ohanlon McCollom & Demerath, are responsible for this website. Demerath Law Office is a Nebraska based law firm, principal office in Omaha, Ne. OHanlon McCollom & Demerath is a Texas based law firm, containing Nebraska and Texas Licensed attorneys, principal office Austin, Texas. Larry Demerath and Justin Demerath are the attorneys responsible for this website. In some situations, your matter is likely to be referred to another law firm or worked on by multiple lawyers. This action will not increase the total attorney fees a client will pay. Unless otherwise stated, the lawyers with this firm are not board certified by the Texas Board of Legal Specialization. The areas we serve include Alabama (AL), Alaska (AK), Arizona (AZ), Arkansas (AR), California (CA), Colorado (CO), Connecticut (CT), Delaware (DE), Florida (FL), Georgia (GA), Hawaii (HI), Idaho (ID), Illinois (IL), Indiana (IN), Iowa (IA), Kansas (KS), Kentucky (KY), Louisiana (LA), Maine (ME), Maryland (MD), Massachusetts (MA), Michigan (MI), Minnesota (MN), Mississippi (MS), Missouri (MO), Montana (MT), Nebraska (NE), Nevada (NV), New Hampshire (NH), New Jersey (NJ), New Mexico (NM), New York (NY), North Carolina (NC), North Dakota (ND), Ohio (OH), Oklahoma (OK), Oregon (OR), Pennsylvania (PA), Rhode Island (RI), South Carolina (SC), South Dakota (SD), Tennessee (TN), Texas (TX), Utah (UT), Vermont (VT), Virginia (VA), Washington (WA), West Virginia (WV), Wisconsin (WI), Wyoming (WY), and Washington D.C. (DC). © O'Hanlon, McCollom & Demerath. All rights reserved.